Happy Sunday, everyone, and I hope you’ve had an amazing week! Mine was quite busy (as usual), and I’m excited to share with you some of the experiences I had and also some of the lessons I learned. My younger daughter and I, back when she was still too young to play in our local league. Each fall for most of the last decade, one or both of my daughters has played soccer in our local church’s youth league, and I have been their coach. Yesterday, my older daughter got her first experience as a referee in the same league, and my younger daughter is now in her last season of eligibility before she ages out of the program. This is a time transition for them and for me, as they continue to get older. Thankfully, yesterday I had an opportunity to be reminded of why I have spent so much time coaching youth soccer (and especially my daughters’ teams). Each season I tell the parents that I have three goals for our team, and none of them involve winning soccer games. You may ask why we play, if not to win; well, please don’t misunderstand me: I LOVE to win. At anything and everything. But when it comes to youth sports, winning is not the main thing. For me, youth sports involve the three goals I referenced above: 1) I want the kids to HAVE FUN, because if they do, they’ll continue playing and they’ll enjoy themselves at each practice and game; 2) I want the kids to LEARN something about the game, because then I know I’ve done my job at each practice and game; and 3) I want the kids to WORK hard, because then their parents are happy! None of those three goals involves winning a soccer game, but if we do those things each and every time we play, then our season will be a success. These kids are 9-11 years old, so no one is winning scholarships or awards or anything like that; so winning games shouldn’t be our main focus. What we are there to do is to teach character through competition. We still keep score, and there is a tournament at the end of the season whose winner gets a trophy. So the competition is very real; but it’s also a great reminder that winning is not the ultimate end. My younger daughter and I yesterday, on her last “First Day” of the season. Time flies! For anyone who is competitive, though, the temptation to “win at all costs” is always there: in youth soccer, in life, in business, and everywhere else. What I’ve found is that coaching youth soccer is as much about character development for myself (and the other coaches and parents) as it is for the children. How often have we witnessed parents yelling horrible things at each other or at officials, over a game being played by kids in elementary school? I know myself well enough to know that I have the potential to be that parent, if my emotions aren’t kept in check. That’s not fun to admit, but I do know it’s true. So for me, coaching the kids is about helping them, and it’s about helping myself grow. What’s the point? Just this: we all need to continue to foster growth in ourselves, and one of the best ways to do that is to help others grow. It’s hard to expect children to do well if we are setting a poor example. And when we do mess up, it’s important that we set a good example in how to apologize, ask forgiveness, and try to make things right (and I had an opportunity to do those things yesterday, too; not something I’m proud of). This week, ask yourself two questions: 1) how am I continuing to develop my own character? and 2) how can I help others grow as well? As always, I’d love to know what you come up with! Also as always, please feel free to share this with anyone you think needs it! Come by the website and sign up to receive your free copy of my ebook called ‘(Extra)Ordinary Leadership: 10 Things Dad Taught Me Without Saying Anything’. Have a great week, and keep leading! Today is Father's Day, and as such I wanted to share with all of you the introduction to my e-book (Extra)Ordinary Leadership, which is written about my dad, as well as the list of 10 Things Dad Taught Me Without Saying Anything. These are lessons that Dad lived and that I observed and have tried to also live out (though, admittedly, I have failed more often than I have succeeded). They form guidelines for how I try to treat others and how I try to lead. I hope that you are encouraged by them and inspired by them. I also hope that they cause you to remember with fondness lessons that your father or father-figure taught you. Happy Father's Day! My father, John Wesley Hawbaker, was an incredible leader: educated at Illinois Wesleyan University (B.A.) and the University of Georgia (M.A. ), he also went through the US Army Officer Candidate School, US Army Airborne School (where he won the Outstanding Leadership Award for his class), and the US Army Ranger School. He was a member of the famous 82nd Airborne Division, and he won three Bronze Star Medals for his service in Vietnam. He also was a businessman, an ROTC instructor, a college professor, and a civic club volunteer. Most importantly, he was a husband and a father. He truly followed the motto of the U.S. Army Rangers: “Lead the Way.” This is about what Dad taught me just through the way he lived. The cover of '(Extra)Ordinary Leadership': Dad in his military dress uniform. The above quote is often attributed to St. Francis of Assisi, though I have not been able to find any record of him actually having said or written it. Regardless, I feel that the sentiment is true, and that St. Francis may have said it is entirely plausible based on his own life of service and love to others. St. Francis was the founder of the Franciscan order of monks, and even hundreds of years later he stands as an amazing example of a man who lived his life in such a way that he consistently put the needs of others above his own. What does it mean to preach the gospel without using words? Actions must show the love of God to others, to the degree that the recipient cannot but wonder at your motivation. Our love must be such that it cannot be explained away by reason or ulterior motive, even by the most jaded cynic. Understood this way, love is a choice, an action, an expression of the will. This idea is addressed by C.S. Lewis in The Screwtape Letters when, writing as Screwtape, he describes the demons as wondering what God is really up to when Screwtape says that “He really loves the little vermin.” To people who don’t understand the love of God, the motives of Christian love will forever remain a mystery. The world will question Christians’ motives, and we must overcome even the strongest objections through our actions. When we do this, and when the opportunity arises for words, the words will then carry the full weight of convictions already proven, not just the often-empty promises of something postponed or alluded to. I do not know if I ever heard Dad actually share the Gospel. In fact, when he was not far from death, I asked my father about his salvation because I simply was not sure, and I was not willing to lose him without being as sure as I could be about his salvation. I knew he had been a good man of high morals, but since he was not vocal about his faith, I was not sure he was saved, and I needed to be. As it turns out, this was one of the more ridiculous worries I have ever had. Upon reflection, it should have been obvious that Dad’s motivation was not anything other than a desire to serve God well by loving other people. When I look back at the many ways Dad served and loved others throughout his lifetime, I began to try to understand the principles behind his actions. The more I examined them, the more I have realized that all of them are rooted in love. Despite being from a generation that often frowned on males showing affection, my father never hesitated to give me a hug or tell me that he loved me. In the same way, many people who knew Dad spoke of how they knew he cared about them because of his actions, his treatment of them. It was this ability to show love to others, to serve them and show them that he cared, that was at the center of who my father was. He was not always perfect, and he often failed, especially with my older brother, with whom he often disagreed. However, as Dad and my brother both got older, this love became more evident, it became more vocal, and it made my heart glad to see how much better my dad and brother got along before Dad died. In talking with many people about Dad, including my mom, I have learned that Dad first learned integrity and love from his own parents, John Myron Hawbaker, a good man by all accounts, and Olive Alice Merriman, a loving and caring mother. And it is the foundation of love that is at the heart of all of the principles found in this book. For those of you who want to know where these principles came from, a brief explanation may suffice. 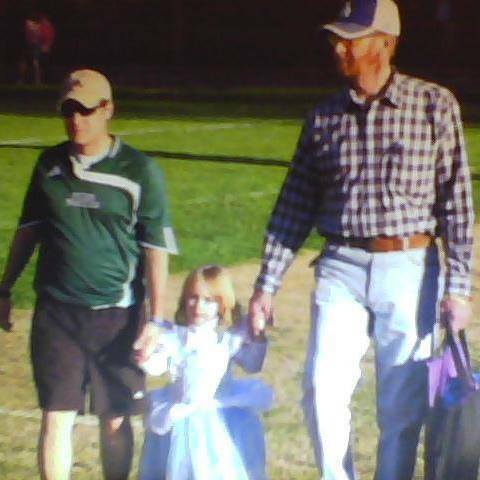 One of my all-time favorite pictures: Dad, my older daughter, and me, on our way to a soccer game. A number of years ago I was asked to give a devotional message for my fellow high school teachers at a Christian school in Alabama. In the process of thinking about that, I started thinking about my father, who had recently passed away. I was struck by a number of life principles that he embodied and yet never spoke aloud. I was also amazed that he had never actually said these things and yet they were so apparent to anyone who knew him. These principles form the core of each chapter in the book. Each principle is written out clearly and then explained using illustrations from Dad’s life. I hope that anyone who reads this is encouraged and inspired to also try to live like Dad did. I can think of no better way to honor him than to try to live out the principles he embodied. In some ways, Dad lived an ordinary, if eventful, life: son, brother, husband, father, soldier, civilian. However, the way he lived and the principles he lived by were extraordinary, and I hope you are encouraged by him. Always show respect to others, even when they don’t extend you the same courtesy. Control your temper--it’s yours, and only you can lose it. Choose to be in a good mood every morning--you can control your emotions, or you can be controlled by them. If there is work to do, do it--no excuses or reasons to avoid it--get it done. You are responsible for you. Own up to your actions and accept responsibility for your choices. There is no person or task that is below your dignity. It’s OK if people don’t know how great you are--you don’t have to tell them. Take care of your family even if it’s hard.